Khulna Division became NCL champions for the fourth time after their rain-affected drawn game against Rangpur Division in Chittagong. Their previous titles were in the 2002-03, 2007-08 and 2012-13 seasons, having also come within a single point of winning the title last season. Rajshahi Division and Dhaka Division have been champions five times each while Rangpur, Chittagong and Bangladesh Biman won the title once each. Rangpur ended the game against Khulna with more points, but Khulna's seven ensured they remained above Dhaka Metropolis in the points table. Rangpur, however, were relegated to Tier-2 after finishing at the bottom of tier-1 with 38 points. Rain had allowed only 32 minutes of play in the first two days of this game. Rangpur, put into bat, made 344 runs, with No. 7 Tanveer Haider making 105 off 209 balls, including nine fours and a six. Khulna captain Abdur Razzak took five wickets while the other left-arm spinner, Murad Khan, took four wickets. There was enough time in the game for Imrul Kayes to score his 14th first-class hundred, a 104-ball 107. Khulna's path to becoming the NCL champions became easier after the match between Dhaka Metropolis and Dhaka Division game had three washed off days in Cox's Bazar and predictably ended in a draw. On the fourth day, Dhaka Metro batted 75 overs to make 286 for three. Shamsur Rahman made 105 while Mehedi Maruf retired hurt on 99. 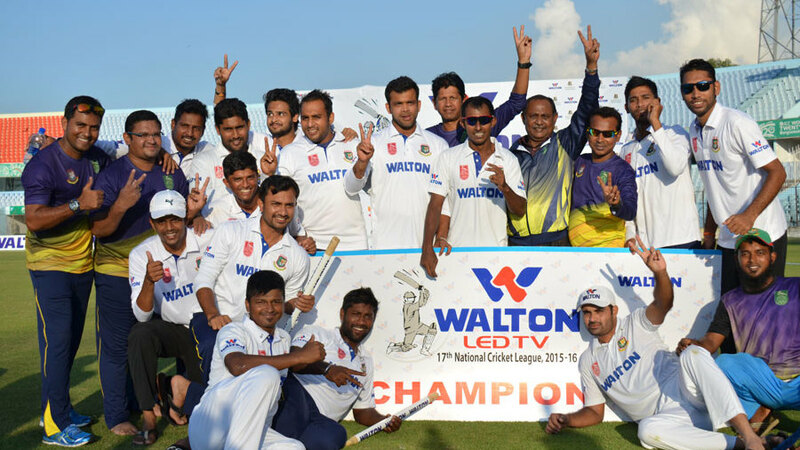 Barisal Division ended the competition on top of Tier-2, and earned promotion to Tier-1 in the 2016-17 season. They drew with Chittagong Division in a high-scoring game in Bogra where Shahriar Nafees struck twin centuries while Mominul Haque completed his maiden double-hundred. They both shared the man-of-the-match award. Batting first, Barisal made 489 courtesy Nafees' 168 and captain Fazle Mahmud's 133. In reply, Chittagong ran up a score of 425, with Mominul scoring 239 after having batted for seven hours and 31 minutes. Mominul struck 37 boundaries in the 322 balls he faced. Barisal fell into some trouble in the second innings but Nafees struck his second hundred of the game, this one bulging up to 174 off 209 balls with the help of 21 fours and two sixes. He added 122 runs for the fourth wicket with Al-Amin who made 68. In the only match of the NCL's sixth round that bore a result, Rajshahi Division crushed Sylhet Division by ten wickets inside three days in Khulna. Batting first, Sylhet were shot out for 176 with Moinul Islam and Sunzamul Islam picking up three wickets each. Rajshahi replied with 395, with hundreds from Farhad Hossain, playing his 100th first-class match, and Hamidul Islam. Sylhet did a little better in their second innings with Ruman Ahmed scoring a hundred. Rajshahi, however, completed the chase of 24 in 6.2 overs without losing a wicket.